Fine lines and wrinkles around the eyes and forehead are often the first subtle signs of aging. These irritating reminders of the aging process are often referred to as “horizontal forehead lines,” “frown lines,” or “crow’s feet.” Botox is a non-surgical option to reduce the areas that make you look much older than you actually are. Botox® works by temporarily weakening the underlying muscles that are the cause of wrinkles. As they are extremely effective, safe, and non-surgical, Botox® is the ideal option for men and women who desire a more youthful, rejuvenated appearance around their eyes, forehead, and mouth. Botox® is made of a neurotoxin, botulinum toxin type A, and is used to temporarily weaken facial muscles, causing lines and wrinkles to diminish. It is a popular option for California men and women who wish to reduce the appearance of frown lines around their eyes and lines across their forehead. It is also used to eliminate crow’s feet around the eyes and unattractive bands around your neck. 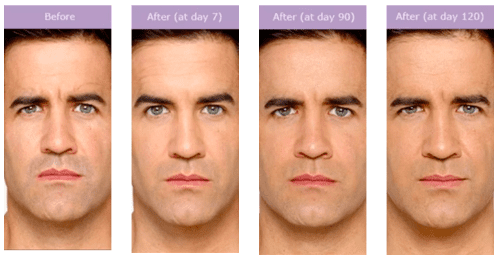 Dysport is similar to Botox® and delivers similar results. Dysport works the same way in that it also prevents the contraction of facial muscles, temporarily eliminating fine lines and wrinkles on the face and neck. While these medications work in the same manner and have similar results, they differ in potency and dosing concentration. Some patients may respond better to Dysport than Botox®, or vice versa, while some patients may be treated best by using a combination of the two. As a double Board certified Facial Plastic and Reconstructive Surgeon, Dr. Mitchell Blum will discuss with you the most effective treatment for your fine lines and wrinkles.